As is my custom, I am happy to share my story of lower back pain suffering to help my fellow patients understand some crucial concepts and lessons that I have learned over the last 3+ decades. The most powerful weapon we have against back pain is knowledge. Without this, we are victims to the whim of doctors, many of whom do not have our best health interests in mind when it comes to treating chronic pain. I never set out to work in back pain education and patient advocacy. I certainly never thought I would become the world’s leading pain coach. However, my life circumstances literally guided me towards these vocations, since back pain became a major player in my world at a very young age. This work is very demanding, but is also extremely rewarding. I am able to see my lessons helping fellow patients every day of my life. I work with some of the very healthcare professionals in the world and have the opportunity to participate in and observe state-of-the-art research projects conducted at major medical institutions. I hope that my 30+ years of experience working in the chronic pain sector can help you to gain the tools you will need to recover from lower back pain. I begin our journey together by sharing my own story, albeit in much abridged form. I have written my story several times on the various sites of The Cure Back Pain Network, focusing on different conditions I have experienced at various stages of life. 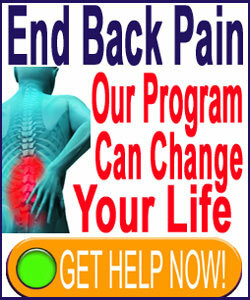 In this site, I will focus on my original back pain problems that began when I was only 16 years old. I will really do my best to keep this version short, as I have already written so much on the topic and these full-length stories can be easily found on our other websites for interested readers. My lumbar suffering began completely out of nowhere in high school. I did nothing to injure my back, but remember getting steadily worse pain in the lower spine, especially when I flexed my neck (looked downwards). I experienced a terrible pulling sensation in the lower back from this motion and it led to pain that was basically there all the time. I had difficulty sitting, studying and being a normal kid, despite my best efforts to ignore the agony. It just did not go away and eventually, my mother took me to see her chiropractor. In retrospect, this was a terrible move on her part, as a physician would have been a much smarter choice. I began chiropractic treatment and this therapy path would continue without any breaks for the next 18 years. During this time, I also consulted and was treated by many traditional doctors, therapists and surgeons. My pain was blamed on degenerative disc disease and 2 herniated discs at L4/L5 and L5/S1. Although I am understating it here, my suffering was immense and had me at the breaking point many times during my teens, my 20s and during my 30s. I became progressively more determined to beat my nemesis and learned everything I could about back pain. Eventually, I became a walking dorsopathy encyclopedia and few doctors could even converse with me on the subject of back pain on a scientific level. I learned all the anatomical facts of back pain, but still could not put an end to my own suffering. That was until I discovered as different path, first introduced to me by my doctor, John E. Sarno. This man changed my perception of chronic pain and completely altered the trajectory of my life. Disability from lower back pain was a major fear of mine, since it was threatened to become by fate by several doctors in the early years of my treatment. I can speak volumes on the effects of such threats and do in this discussion on lower back pain disability. My lower back went out many times in the early years of my pain struggles. What exactly does it mean when your back goes out? Suffering recurrent flare-ups of low back pain can be frustrating, infuriating and fear-inducing. Recurrent pain makes living a normal life quite impossible. Intractable low back pain describes the very worst symptoms that are gut-wrenching. I suffered pain that literally made me feel as if my spine was breaking. Lower back agony leaves tangible damage in its wake. This damage is rarely physical, but instead is perpetrated against the psychoemotional self of the patient. Excruciating lower back pain is one of the worst varieties of chronic pain, as confirmed by pain scale measurements from patients globally. Most clinical medicine providers agree that lower back pain is the single most agonizing health issue a person can suffer. Have you recently suffered a lower back pain relapse? I have experienced many of these in my life and have learned so much the experiences. People with low back pain have certain definite personality profiles that are almost universally expressed. It is amazing how the similarities among lower back pain sufferers are found in the psychological makeup, rather than the work they do, their general health or other “physical” factors. The incidence of lower back pain continues to grow and doctors seem powerless to stop it, treat it or cure it. There is good reason for these failures, as will be detailed in this insightful essay. Learn how to prevent low back pain with methods that I know will work, if applied correctly. I have used these practices to improve my quality of life dramatically over the years. Why does my lower back hurt? Is this a question that you have asked yourself time and time again, since the doctors do not know? I know I asked it several thousand times when I began to doubt my diagnosis decades ago. Does sitting cause lower back pain? This is one of the most common questions that I personally receive. I decided it was time to write on the subject to help all of you understand the potential spinal dangers of sitting. I was able to completely cure my back pain, as well as other health issues I endured chronically, without drugs or surgery. I originally used a hybrid version of Dr. Sarno’s program and then crafted my own practices that would eventually become the basis of my proprietary and acclaimed pain coaching program. I have suffered various recurrences of pain over the years, but have become more knowledgeable as to their causes and have therefore been much more successful at being free of them quicker and more effectively. At this stage, I am happy to be pain-free. In the grand context, my pain has become irrelevant, which is why I kept this story shorter than usual. What has become most important to me is your pain. I know that so many of you are still struggling against an often hostile and opportunistic medical treatment industry and you need help. I have made it my life’s work to repay the kindness shown to me by some excellent doctors and researchers. I have acquired a huge base of knowledge about back pain and with the help of my wonderful editorial board, I am happy to share it with all of you on our websites, as well as in my coaching practice.